When can you do it? If you are a certified diver aged over 12 years you are welcome. The course program rolls over only 2 days, so we can almost always fit it in. Call us or send us an email to book your adventure today. What do we do? 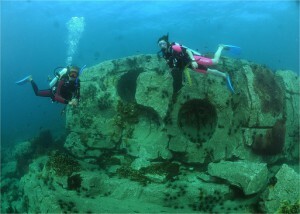 The PADI Advanced Course consist of 5 Adventure Dives. Some are mandatory like the navigation dive and the deep dive. Some are highly recommended, like the night dive and the Peak Performance Buoyancy program and some are just fun and exciting like the drift dive or the underwater naturalist. Tell us about your experiences and abilities so we can make the best possible program for you. Before each dive you and the instructor will go through the theory covering the topic, and you will probably get a lot of the instructors additional information. Price: $360 including all required PADI advance open water course materials and certification fees, full rental equipment, boat trip, coffee, tea, soft drinks, lunches, snacks and of course all the training. Bed & Breakfast are available at Octopuses Garden, but are not included. We would like to recommend you to do the last day of the course on Condor Reef or Shark Island. These are our premiere dive sites. An additional payment of $35 does apply. Book your PADI Advanced Open Water Diver course today by sending us an email or calling us.